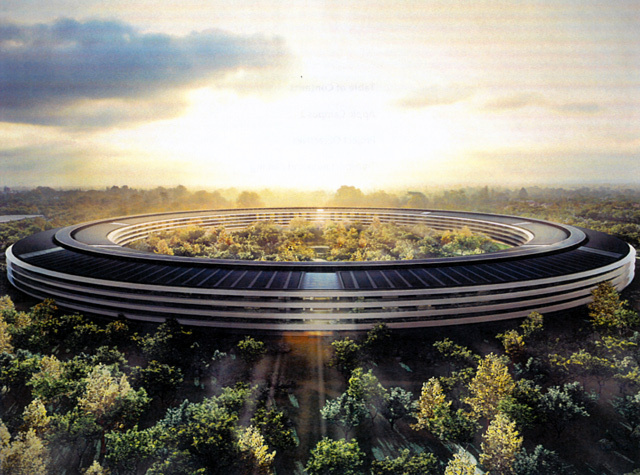 Technology giants Apple and Google have strange, new corporate campuses on the horizon, the New York Times Style Magazine, T, has noticed: Google's a slightly downsized tent-like structure and Apple's a very large, flightless doughnut spaceship. But what does it all mean? Whence do these temples of technology draw their inspiration? 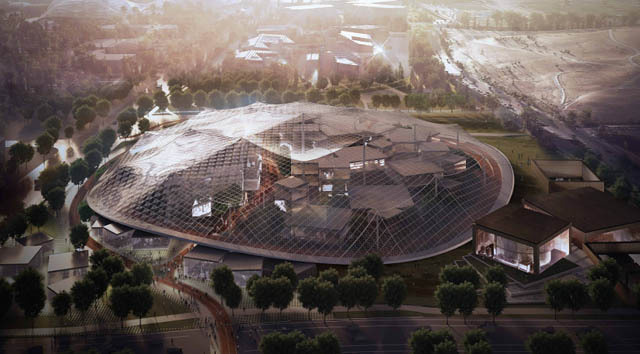 The designs — Google's in Mountain View by Bjarke Ingels and Thomas Heatherwick and Apple's in Cupertino by Sir Norman Foster — may look like space stations or alien outposts, but, as the Times explains, neither is other-worldly. Their aesthetic "comes, transfigured, from the wrecked dreams of communal living, of back-to-the-land utopias, of expanding plastic spheres and geodesic domes that populated the landscape of Northern California around the time (and around the same place) that the first semiconductors were being perfected." The Times' argument turns on Stewart Brand, who with writer Ken Kesey was a member of the road-tripping, radically self-reliant Merry Pranksters. Brand's Whole Earth Catalog which launched in 1968, "advocated ’60s ideals of autonomy, do-it-yourself design and deep ecological thinking." Advertising the tools to build and grow structures — physical and societal — Brand wrote in a 1971 issue that “Any design fantasy is just loose talk until it happens,” and that new physical spaces were capable of, “bending reality off into unimaginable directions with no restrictions save the harsh ones of nature.” Not coincidentally, the offices of the Whole Earth Catalog were just such a bubble or dome. "Architects became attracted to furniture and buildings that resembled bubbles," the Times writes. As for the many meanings of bubbles, the article suggests a few: "The fact that they were temporary was the key: Like the conversion of garages into tech offices, the bubble shelter was meant to be forgiving, improvisatory, for a nomadic and restless society seeking a new relationship with how to fuse life and work." So that is symbolically with Apple's campus, which appears temporary in its stay on Earth, and actually with Google's campus, which is designed to shift and change physically according to demand. That's where another bubble metaphor comes into play. "The new unearthly Silicon Valley campuses represent the triumph of privatized commons, of a verdant natural world sheltered for the few," editorializes the Times. "The new Apple office will cost an estimated $5 billion, making it possibly the most expensive office building in history. We are dealing with a bubble of a different kind."